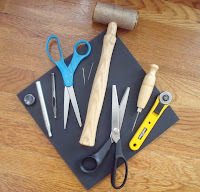 I'm always eager to find good uses for my material scraps, especially the leather. The primary inspiration for this project came about from discovering the excellent Lark book, The Art of Jewelry: Paper Jewelry. There was a lot of great stuff in here but the amazing K. Dana Kagrise bracelet (featured on the book's cover) is what captured my imagination the most. 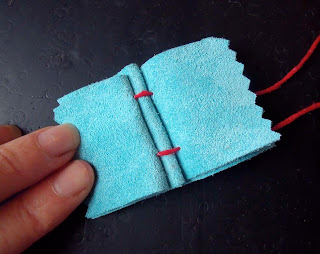 I love the concept Kagrise used of employing techniques associated with book binding to create her elegant vellum cuff. It got me excited to try something new with my stuff in my scrap pile. For my variation on this idea I was finally able to use these super pretty turquoise pieces I've had sitting around! Step 1: Begin cutting scraps into 1 1/2" wide strips. 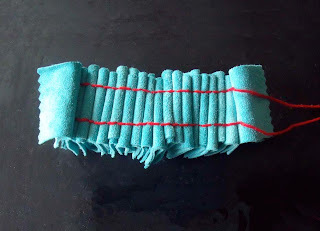 Step 2: Straighten the uneven end on each of the strips. Step 3: Measure lengths of 2 1/2" and cut. Step 4: Trim the two shorter sides with pinking shears. 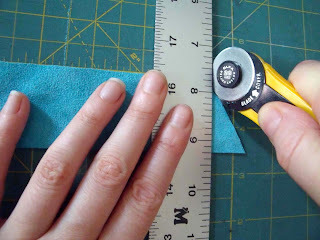 Step 5: Cut a piece of pattern paper into a 2 1/2" x 1 1/2" rectangle, then score it directly down the center using an awl. Follow by making two pin marks directly on the score, 3/ 8" from each side. Step 6: Stack four leather pieces on top of one another, with the pattern paper on top. Press your awl firmly into each of the two pin marks, so that all the pieces of leather will have holes in those precise spots. Step 7: Cut two 2" x 2" square pieces of another scrap leather and set aside. These pieces will later be used as anchors to the rest of you project. This is also where the snaps will go, so the sturdier the better! Step 1: Now the leather pieces are ready to be strung together. 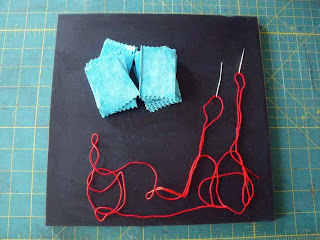 Begin by cutting a fairly long length of embroidery thread and threading through two needles, one at each end. Do NOT knot. Step 2: Place two pieces of leather on top of one another and put the two thread needles into each of the holes. Pull both sides evenly through until it looks like a large stitch. Step 3: Bend the piece of leather you just sewed though, in half and flip the pieces over. Now you will put the needles through the opposite holes. This time going only through the single piece of leather. ... you're ready to add the next two pieces of leather. Step 4: Repeat steps 2 and 3, always adding two pieces of leather at time, until you have a chain that look like this, with approximately 17 pairs. 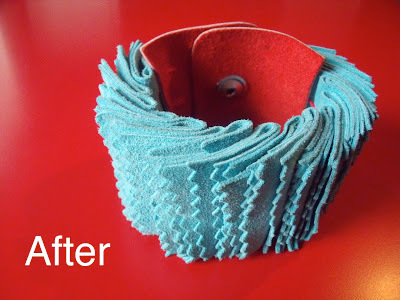 Step 5: Securely tie off your knots and cut away the excess thread. 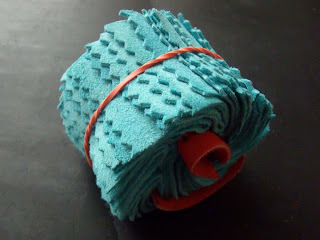 You can give the knots a little extra reinforcement by using a drop of glue on them. 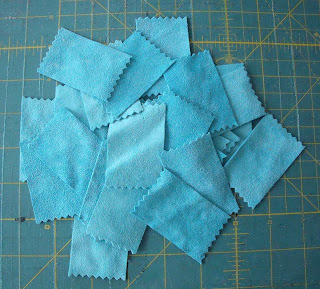 Step 7: On the side where the turquoise leather is going in the same direction, use your awl to make 6 holes (2 rows of 3). 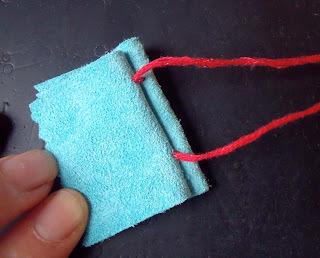 Follow by sewing through them all until you are sure the two pieces are secured. Step 8: On the side where the leather is facing in a different direction from the leather tab, you will only make three holes with the awl. 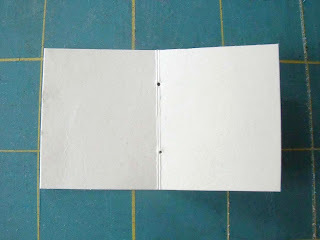 The holes will all be made in the crease separating the couplet. 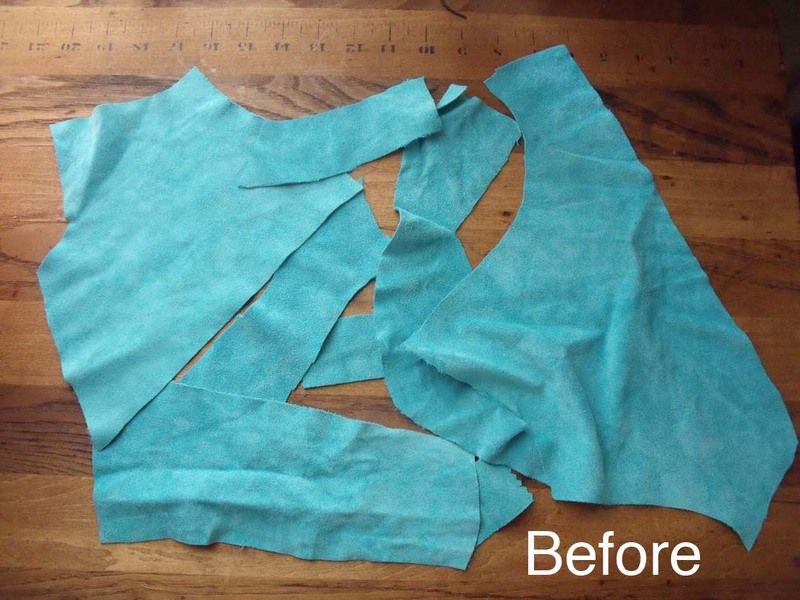 Sew straight across until you are sure the two pieces are well secured. 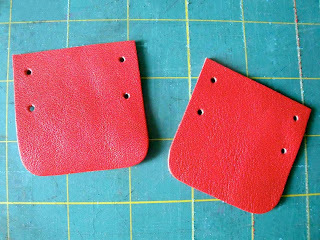 Step 9: On each side, use a leather punch to make a hole in the leather tabs, where the snap will be placed. Insert the snap components and set with a snap setter and pedestal. 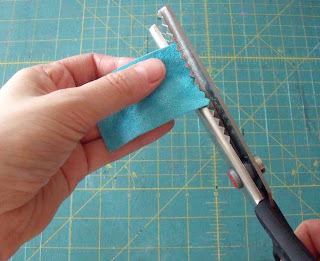 Step 10: The final step is using scissors to trim away any pieces that have moved out of alignment, until all are looking clean and straight. What a compliment from a blogger I'm so fond of! Awesome, Lacie! Pintrest is one of my favorite things on Earth! Very informative article. 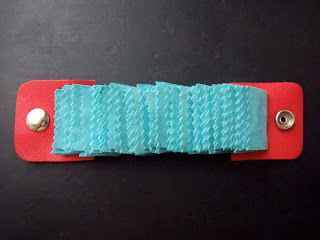 There are so many great things one can do with scrap leather! Thank you! Scrap projects are always some of my favorites. Thank you so much for your kind comments about my work! I am SO happy you approve! Thank you so much for the inspiration. Another Kat? The world just imploded! Thanks, Kat! Yeah, this one is definitely not as quick and casual as lot of my other posts. Wine helps, though!